Michelle served as the statewide coordinator of the Virginia Master Naturalist program from 2005-2012, returned in 2014 to serve as the Special Projects Coordinator, and became the director of the program in 2015. She is an Extension faculty member in the Department of Forest Resources and Environmental Conservation at Virginia Tech, but her office is in Charlottesville. She provides assistance to the state's 29 VMN chapters; teaches basic and continuing education courses; leads development of new training resources and program initiatives; and engages with sponsoring agencies, partnering organizations, and national organizations to support the program's mission. Michelle loves working with the amazing cadre of VMN volunteers to benefit Virginia's natural resources. She has a particular interest in citizen science, and, as part of her Master’s research in ecology at the University of Minnesota, she started the Monarch Larva Monitoring Project. Michelle's other professional roles have included Citizen Science Director at Great Smoky Mountains Institute at Tremont and Director of Science Education and Public Outreach at the University of Virginia. Outside of work, she enjoys volunteering for the Virginia Frog and Toad Calling Survey, hiking, biking, cooking, and playing old time fiddle. She is also an active Virginia Master Naturalist volunteer in the Rivanna Chapter. 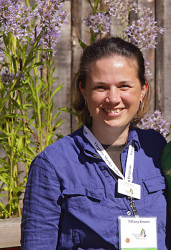 Tiffany Brown is the administrative support for the Virginia Master Naturalist Program. She handles logistics and planning for statewide and regional conferences and meetings, collects and compiles annual reports, manages program budgets and accounts, and generally supports the program, its chapters, and its volunteers. She resides in Christiansburg with her two daughters, Ama and River, and works out of the Department of Forest Resources and Environmental Conservation at Virginia Tech in Blacksburg. Terri Keffert is the Volunteer Coordinator for the Virginia Master Naturalist program and is located in the Charlottesville office. She serves as a liaison with volunteers by advising them on program policies and best practices, and responding to public and volunteer inquiries. She shares the many service and continuing education opportunities to volunteers through an online calendar, listservs, mailing lists, and social media. Terri also supports the VMN program by updating and maintaining program documents, assisting volunteers with the use of the online record keeping system, and helping with program marketing and outreach. ​Terri has a professional background in marine/estuarine ecology and restoration at Va Institute of Marine Science, water quality at Chesapeake Bay National Estuarine Research Reserve, wetland mitigation, and historic seed preservation, as well as an academic background in Environmental Science and Botany from Christopher Newport University. While enjoying the harvesting, testing, preservation, and processing of historic seeds that she was responsible for at Thomas Jefferson Center for Historic Plants, it was coordinating and assisting the wonderful volunteers that gave her even greater pleasure. She has found training and supervising volunteers at several other nonprofits to be very rewarding. An enthusiastic Master Naturalist with the Rivanna Chapter since 2008, she enjoys teaching butterfly identification and heirloom seed-saving workshops, and leading citizen science surveys. In her free time, she loves to explore new cultures, listen to good music (it’s all good! ), and be outdoors as much as possible, standing in awe of the wondrous natural world around us.